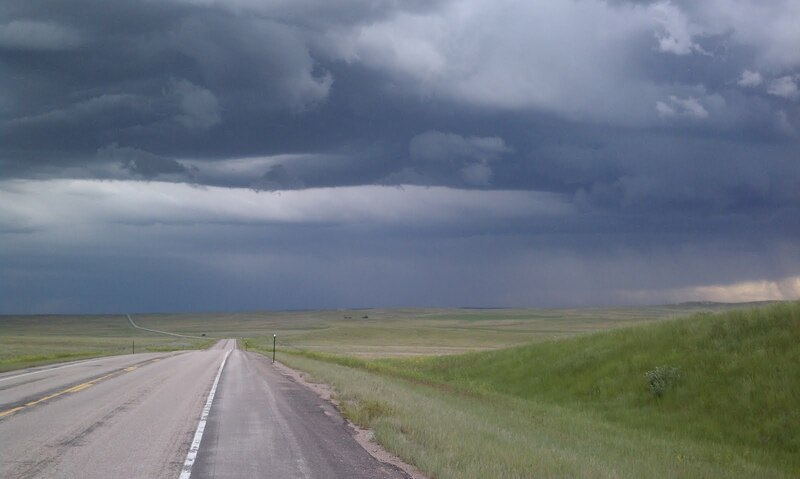 On June 23rd I was approaching the Thunder Basin National Grasslands with great anticipation. I love wide open spaces, and “grasslands” suggested easy camping. I had an interview late in the afternoon in the town of Wright, WY, which was sandwiched between oil fields to the west and the enormous Thunder Basin Coal Mine, one of the largest surface mines in the country, to the east. I enjoyed the interview because the reporter/cameraman reminded me of a friend back home. I was gratified that he filmed me selecting fruit, a rare buying option for me and a nice counterpoint to the latest media coverage that showed me shopping in the candy aisle. I left Wright at 5:30 pm with 20 miles still to go for the day, perhaps 15 of these miles through the mine. 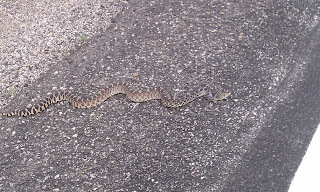 Road construction slowed me further. Road crews were sealing cracks with tar, which stuck to my tires picking up and retaining sharp objects, resulting in two flats. The tar also trapped bugs which attracted birds, two of which became stuck as well. The roads seemed to be primary feeding grounds for all sorts of birds through the bulk of my trip, and car-struck birds were one of the most common roadside casualties I saw. The birds were easy to free, but their prognosis was uncertain with tar on their feet and wings. It became dark and I was still surrounded by the mine. I was tired after a long, hot day, but my spirit was strong, and I felt no rush to get past the mine. The mine in the dark was surreal. The trucks were huge, with tires 14 feet tall, and they hummed around on the dark mine landscape with what looked like just parking lights. When an “oversize load” chaperone truck would pass me from behind in this region, I would get off the road, because the “boxes” (the part that holds the coal) of these trucks took up more than the two lanes of road, and had to be driven to the mine over the roadways. While there were signs warning of blasting and dangerous yellow clouds, the only mine activity I could observe was these trucks carrying huge loads of coal from the excavations to the train cars, the train inching forward a car length every minute or so. As I passed the first engine of one of the trains, the engineer blew the train whistle. 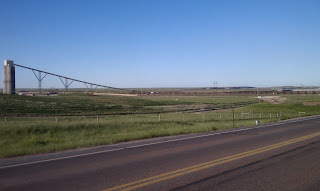 An article the previous day in a Casper newspaper quoted me praising commercial truck drivers for their courteous treatment, and trucks had been beeping and waving to me all day as a result. Whether or not the blast from the train was a friendly greeting or part of the business of hauling coal, I took it as a “hello,” and it added fun to the cool air and unhurried pace which characterized the last miles of most days for me. There were few cars on the road by now—it was 60 miles to the next town of Upton, and it was not near a shift change. In the wide Wyoming sky I could see fierce-looking lightning way off to the south, but it was so far away that I heard no thunder. The night seemed magical. 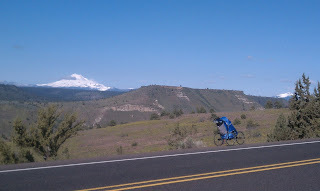 I left the coal mine near 10 p.m. and hoped to get several more miles in before setting up my tent. 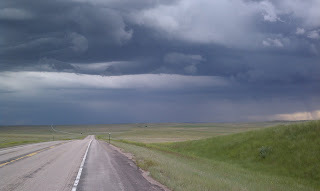 Meanwhile, the thunderstorm now seemed to be approaching quickly, and the thunder became audible and soon threatening. I raced to find a suitable camping spot, lightning-safe and sufficiently off the road for privacy. My headlight was too dull for this purpose, so I used the illumination from lightning and headlamps from the once-every-20-minutes passing car. For each approaching car, I would cross the road so that I was on the opposite side, since the cars surely didn’t expect to see a pedestrian out there, no matter how reflective and blinking I was, and they were flying. On one such crossing, mostly blinded by the approaching headlights, I saw a lump in the road and avoided it as I crossed. 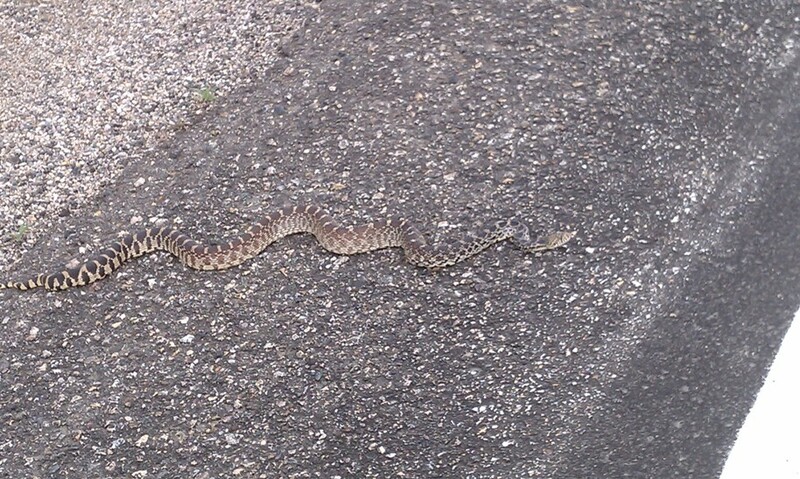 When the car passed I saw with my headlamp that it was a prairie rattlesnake, a lucky miss for me, but my natural reaction was more excitement than worry. In the morning I slept through my watch alarm. I was not using my impossible-to-sleep-through phone alarm because my phone was low on batteries and my father-in-law was having surgery the next day, so battery power was precious. I kept my phone off. I awoke to the friendly-seeming good-morning beep of a passing truck just after dawn. The later I set up camp, the lower my standards for privacy, and I often awoke in tent sites that were alarmingly public, though I was never harassed. This morning my tent and stroller were in plain sight among the sagebrush. I packed up my wet gear and hit the road for Upton, 50 miles down the road, expecting just an occasional ranch along the way. The day grew hot, very hot; the sun was unrelenting with no place to go off the hot asphalt. Also, the plums and quart of blueberries that I purchased on camera the previous evening were wreaking havoc with my digestive system. Apparently I had become specialized in my ability to digest only junk food. 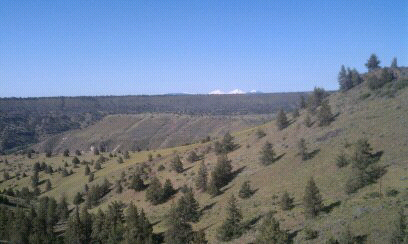 This was rolling terrain with poor cell phone signal. Because I was camping most nights, I had few opportunities to charge my cellphone batteries (only when shopping for food), so I kept my phone off, turning it on at each hilltop to check in with my wife Colleen on how my father-in-law’s surgery was going. He had been feeling miserable, seemingly unable to digest food, for some time before I left, and I was grateful that his surgery day had finally arrived so he would get some relief. When I reached Colleen by phone after surgery, I learned that the surgery revealed the cause of the pain was a widely metastasized cancer, and his prognosis was bad. A bad cell signal meant I could not hear most of Colleen’s words. The essence was clear, but real communication was almost impossible. When we hung up, I just sat down on the asphalt and sobbed. I felt so far away, such utter despair. I continued on toward Upton, where I planned to spend the night camping in the town park; I hoped to find a place to charge my batteries overnight there. As the day became hotter, I felt increasingly vulnerable to the heat. There is no shade in the sagebrush prairie. Though I stayed well hydrated and don’t think I was in much danger, I was going through my beverages more quickly than I had been, and there was a chance that I would have to find water to purify. During this period a car approached and stopped to ask if I wanted a ride to get out of the heat. I was somewhat fuzzy-headed, and I didn’t realize at first that he was telling me that he was the one who beeped at me in my tent as he drove into work at the mine. I told him I needed to get to Upton, still 30 miles away, on my own. He asked where I planned to stay, and he told me I could stay at his place when he learned I aimed for the park. I barely noted the directions to his house because I really wasn’t up for being social that night, but I felt grateful for his kindness, stopping for a stranger along the highway. His name was Ray. Not long after Ray left, clouds formed in the center of the sky and darkened. My gratefulness for a break from the sun turned to concern as lightning appeared. Soon afterwards a blast of wind lifted me off my feet, and my concern turned to awe when the clouds became ominously black. I took out my cell phone because this seemed like the kind of cloud that would produce twisters. (I already had a tornado plan and had identified a roadside ditch, for better or worse). The power of the storm felt cathartic, but I realized that I was pretty vulnerable and tried to outrun it (meaning I hoped it would move west as I ran east). However, the clouds spread from the center of the sky outwards, and I knew I was going to have to deal with weather soon. Just then another car approached and stopped. This driver, also traveling from the mine to Upton, told me that the prediction was for golf ball to softball-sized hail. We stuffed as much of the stroller in his trunk as we could and barreled into town. (Turns out that a nearby town experienced baseball-size hail, but not along my route.) At my request, he dropped me off at a convenience store in Upton so I could buy some juice to drink, after which I walked up the hill toward Ray’s house. I reached Ray’s house just as the downpour started. I was greeted at the door by Ray’s 21 year-old son who didn’t seem to know of Ray’s invitation to me and awoke Ray from a nap to let him know that I arrived. I was not feeling very social, but Ray was assertive, yelling “Glenn!” when I lingered in the shower or down in the basement rec-room where I was going to sleep. The room was set up comfortably with easy chairs for TV watching and proudly displayed pelts—bobcat, coyote, raccoon, and others—and impressive racks of elk antlers. Cowboy boots with intricate ornamentation were lined up in front of the door, my smelly running shoes alongside. We talked a bit at the dining table, the three of us, about their experiences ranching and hunting and mine on the road, before I excused myself to bed; I was physically and emotionally exhausted. My plan was to walk down into town early in the morning and hitchhike back out to where I had left off 18 miles shy of town. After working many days in a row at the mine, Ray was off the next day, and he could sleep in for a change—no long commute. As I headed downstairs, Ray asked what time I was going to leave, and when I told him 6 am, he said he would give me a ride if he was up. Just as I was about to turn out the light and settle into an easy chair to sleep, I heard a gruff “Glenn!” from the stairs, and Ray entered with a bottle and a dixie cup. He said he had something to help me sleep. I told him quite emphatically that I did not need anything to help me sleep because sleep came to me instantly, but he was insistent. In my depleted state I was afraid to drink anything, let alone anything a cowboy would serve up to help me sleep. Already feeling somewhat emasculated as a skinny-legged vegetarian wearing short shorts in a cowboy household surrounded by pelts, I was doubly worried about choking and gagging on his potion, removing any last grasp on machismo I might still have had. But Ray, a man of few words, had very expressive eyes, and his eyes had a twinkle that convinced me to trust him. “It is not what you think,” he said, perhaps in response to a look of utter terror that probably gripped my face. Not knowing whether I should drink it in a gulp like a shot (which I have never done) or sip cautiously, I opted to sip and was treated to one of the smoothest, richest tastes I have ever experienced, Ray’s very own raspberry rhubarb wine. Wow, was that fine! In the moment before I fell asleep, I was grateful for the comfort in the most unexpected place, at the end of one of the hardest days of my life. These two nights were not typical, but only because there were no typical nights. Sometimes this trip felt Shakespearean, because incredible experiences were happening every day, and often all day long, as if time were compressed. Though I was on a time-constrained long-distance journey, both time and distance often seemed beyond my grasp, I was so consumed by what was before me at the moment. In this way the trip seemed otherworldly. And then I was almost home and then ­­there was the Atlantic Ocean. How did that happen? I felt an odd feeling of belonging in the most unfamiliar places after a while, since I felt at home on the road and most people I encountered were so welcoming of me. “Community” expanded for me this summer to include wherever I was and whoever I was with. I have continually wondered, though I have more work to do understanding this, if there was something exceptional about this trip that shaped my experiences and other people’s generous reactions toward me. Was this trip somehow larger than life and so the lessons from it not necessarily generalizable to the life I returned to? I do not think this is the case; in fact I think in many ways the opposite is true. 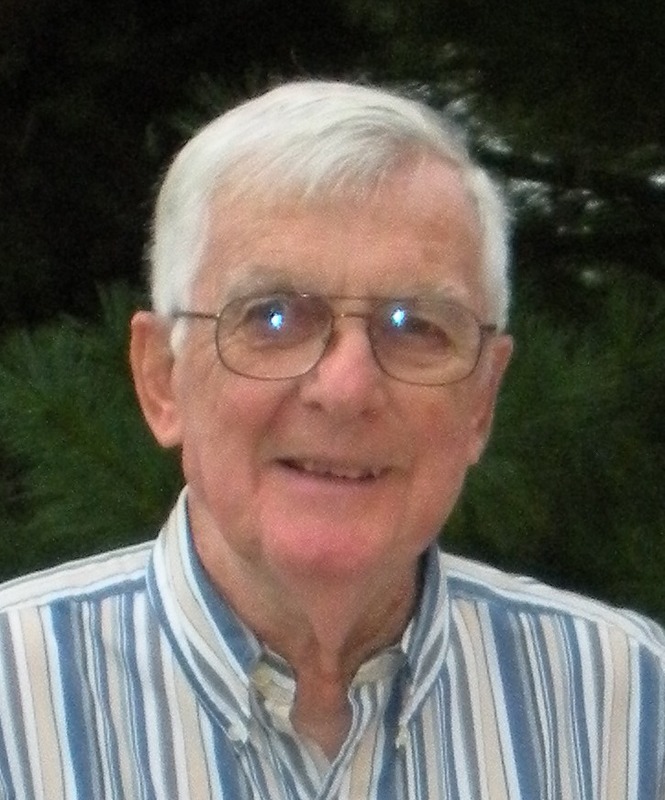 While I was away on my trip, my wife and her family were surrounding my father-in-law Jim and each other with love, in the last weeks of his life. Jim, despite his pain and exhaustion, expressed his love and appreciation to those around him, often with humor. He was preparing himself and others for his passing. From afar I watched how this large, wonderful family came together to navigate impossibly difficult choices, celebrate a life, and to mourn. I was fortunate that I was able to fly out for a day before he passed. For me I needed to be a part of this, and I will always treasure this visit. During his memorial services the next week I often thought about a tiny three-photo frame we have just inside our front door at home. In the middle is a picture of Jim in the garden of my wife’s and my first house during a spring shower, joyously holding skyward tomatoes he just harvested in one hand and an umbrella in the other. The photo is flanked by photos of each of my daughters when they were young, both with joyous smiles. I love the connection, and how this characteristic of Jim whether harvesting tomatoes, spotting a bear, or catching a fish is evident in the day-to-day lives of my daughters and Jim’s other grandchildren. The interactions of everyday life are what matter, though sometimes we need to step away to see. The best days of my trip were the two days I planned not to run, but not because I was not running. I visited my daughters in Minneapolis and Ann Arbor. They pampered me like crazy, but it was not even this that was so enjoyable. Losing my dad to Alzheimer’s shortened and transformed the relationship between him and my daughters. He would have loved them beyond words and would have been so proud of the adults they have become. On these visits with them, I became much more focused on how he lives on through them. Both my daughters visited my dad often, even through the late stages of his disease. They knew the grip of his eyes when he would lock onto their faces, so soulful, so loving. The potency of these moments of connection when my dad’s body and mind were so ruined by Alzheimer’s is too much for me to make sense of, and a very hard memory for me to revisit. I was reminded of these feelings when touring a memory care unit in Milford, PA last weekend. I met a woman with advanced dementia—please forgive me for not describing her manner beyond saying that she did not seem to be in peace. I tried my best to communicate with her—make a loving human connection. I tried to understand what she might be wanting so I could help her find comfort, but I was unable. I rubbed her shoulder and tried to cheer her up with conversation, but I saw no sign that she took any solace from this. Upon leaving her room, all I could do was cry. There are no words. It is so very sad. Part of my motivation for my trip, the personal part, was to continue with my mourning process for my dad, made so difficult by the nature of Alzheimer’s. Often throughout the trip memories would surge into my mind, most happy ones, some sad. I often found myself sobbing on the highway, and I began to think this sobbing, whether when thinking of my dad or father-in-law or the many beautiful people in my life, less as a sign of despair, which is how it often feels, but more as deep recognition of the love central to my life. After my dad died, I read (upon the urging of my kids) Thornton Wilder’s Bridge of San Luis Rey, which examines the nature of love and the meaning of life. I read the novel through the night, and the line “the bridge is love, the only survival, the only meaning” hit me with an emotional punch. Being so attuned to my daughters’ love and my love for them during these visits to their homes was joyous. 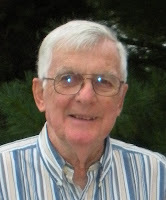 The anniversaries of my dad’s birth and death were during these couple weeks as well, and the connection between him and them was plain to see. It was very hard to get on the road after my father-in-law’s memorial services, but I was motivated by his strong support for the trip right up to his passing. Though it was difficult leaving family, I was not on my own. I was blessed on this trip feeling like I was allowed to tap into many different webs of love, as if I had a special pass-card. Friends of friends would help me, for example, and it always felt like the love these friends had for each other was being expressed through the support of me and alzrun. What a privilege! Love is the only way to describe the generosity I received. The love was not so much directed at me as toward the greater cause of doing something about Alzheimer’s. So many people told me as much. Many wanted to be part of an effort to make some difference, to help end Alzheimer’s disease. Some were acting out of deep love for a family member or friend who had Alzheimer’s and jumped at the opportunity to do something to honor those afflicted. It is easy to feel powerless in the face of such a horrible disease. Our message is simple: we must find the resources to stop Alzheimer’s. It was my honor to carry that message across the country. To all of you, whether through donations or words or actions, did something to help stop Alzheimer’s disease, to end the suffering by millions of beautiful people like my dad—thank you! In spite of a tough economy, many, many people made donations. When I returned home Wednesday, I received a list of donors six pages long! I cannot tell you how wonderful that makes me feel. The Cure Alzheimer’s Fund will use every dollar to fund important Alzheimer’s research. There is cause to be hopeful. Much is being learned, finally, that I hope with all my heart will spare other families, and mine. Thank you for being an essential part of AlzRun. I feel so honored. Now that I am in the middle third of the run, I have three corrections to make. First, so exhilarated was I when the clouds cleared after crossing the pass at Mt. Hood in the beginning of my trip that I enthusiastically tweeted photos of Hood as soon as the clouds broke and I saw the iconic, snow-clad mountain, easily forgiving the fact that it was in entirely the wrong place. When the skies further cleared, I saw that such beautiful peaks punctuate the entire skyline in Oregon, and it was probably Mt. Adams that I was calling Mt. Hood. Fortunately, this ease I have to see what I expect has not gotten me into trouble navigationally, but it will happen. Second, it was probably good that I thought the Teton Pass was on the Continental Divide and the highest point of my trip. It made a glorious day all the more thrilling, thinking it was "all downhill" to visiting my daughter Celia in Minnesota. My trip is always framed in two to four day sections, due to limitations in my smart phone screen size and software, which makes it hard to look at broader maps or topographies. Mostly it is due to my brain's inability to keep track of much more. This has been generally good, keeping me more in the present, less overwhelmed by how much is before me, but I do sometime get anxious that I lack a longer range view. The high point, as it turns out, is Togwotee Pass, quite a bit higher at 9,658 feet and the actual crossing of the Continental Divide. I crossed this two days after Teton Pass. Now it is all downhill to Celia! Third, and most significantly, I have been referring to this trip as "self-supported" because a significant part of my day to day existence involves pushing my 60+ pound stroller and finding safe places to sleep and food to eat. Yet, I am utterly dependent on others. A better term might be "supported generously, continuously, and unpredictably by people I know and don't know" (an unwieldy term, I admit). I cannot overstate this. My emotions are often on the surface on this trip, not so much because of my routine that requires that I push on (even when I don't feel like it), but because it is an amazing experience to be continually on the receiving end of such love and generosity, everyday. My regular Sunday running group finishes each summer run with a plunge in a cold water stream near my home called the Green River, the perfect therapy for legs punished by a long hilly run. I always wanted to be the kind of person who could just dive in, but instead have been a one-toe-at-a-time type. Two years ago, I was determined dive in, like the others, but it always took me so long to get up the courage, knowing the bracing shock that awaited, even though the shock was over in a moment and the benefits would be wonderful and lasting. It didn't help that me friends' shrieks betrayed how cold the water actually was, despite what they would say. But I learned a trick: I don't have to dive into the water; I just need to dive into the air and the rest would take care of itself. Maybe I am simple, but this works for me. This describes how I went into this run, though on a different scale. I had too little time to plan, and I tried to be aware of and prepared for the things I wouldn't recover from, but the rest, which is to say most of the trip, I hoped would take care of itself. And it has so far. The only desperate time, when I first arrived in Oregon not having slept the night before because of packing, that I had a Wile E. Coyote moment, if I can go back to the jumping in the air metaphor, where I had a period of being suspended midair, panicked about what was about to happen, the scale of my commitment and my inability. With Wile, when gravity kicked in, it meant a plunge to a stream way below (kerplush). For me "gravity" meant the nurturing guidance of people I had not met previously but now consider dear friends, Joan and Nick, who got me through the day and the weeks that followed directly and through family and friends of family and friends of these friends--you get the idea. Gravity for me also means running home. When I am on the road running toward home, I feel good at the deepest level. I find it interesting to discover that progress, no matter how painfully slow, is what matters most. I need to keep moving. Daily I meet people, sometimes I don't even meet them, who support me in meaningful ways--logistically, physically, or emotionally. The number of vehicles that beep and wave or move way over astounds me--thousands--and these small acts mean a lot to me. People I encounter when I stop are almost always wonderful, whether it is making me a black bean burger in the middle of a national forest in Oregon after closing time (heaven to a protein-starved vegetarian in beef country), to a rancher who shouted out from the woods as I ran past, wondering what I was up to. His family had experience Alzheimer's disease, and he gave me heart-felt encouragement (and grizzly advice!). A farmer in a saloon far from a town, an unexpected place to get some fuel, insisted on buying my sodas and shaking my hand. "No one doing what you are doing should have to buy his own soda" he said to me and other patrons nearby. Two nights ago after a day of running into a headwind, cold rain, and lightning, multiple generations of dancers from the nearby Wind River Reservation, passing through on their way home from a performance, cheered me up in what was my home for the night with their conversation and warmth. These interactions happen by the dozens each day--with people from places and lifestyles very different from mine. Caring for me, and I for them in return. Some relationships are deeper. The folks that ran with me or hosted me for a night or a breakfast or lunch--there are so many beautiful people in these places that seemed so far-flung. Many of these relationships (joyously) continue through facebook, email, twitter, and phone. Every single day I wake up to find my body ready to go, but my spirit not so sure. These gestures from these new friends and old friends and family--often even strangers who heard from word of mouth--not just get me going but make me excited to have the privilege to do so. Several times cars await me on the side of the road having heard that I am coming into town. Some spot me driving past (sometimes several times--there aren't many roads out here) and stop to chat, having heard of my run from others or just curious. My new friends Norm and Alicia, who hosted me when my leg first swelled up, passed me on the road many days later coming back from a trip with protein bars, a dozen boiled eggs, and friendship. 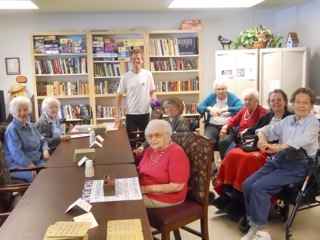 The two days I spent in the Valley View Assisted Living Center in John Day, OR, was a turning point for me. I could not get the swelling in my leg to go down, and I was very discouraged. The staff and residents pampered me, encouraged me, and told me I needed to call them when I reach Rhode Island, when I was doubting that that was possible. So many individuals were so nice to me over those two hardest days, I wish I could describe each of them. I will just single out Etta, whose dad had Alzheimer's, who, like many others I've met on the trip with Alzheimer's in their family or among their close friends, shared with me a deeply knowing and powerfully moving connection--an understanding of how much is lost and how much is at stake. The folks at Valley View gave me several things, but among them is an American flag that you might have seen on my twitter pictures (It needs a little patching due to strong winds, but I will do it.) They told me that my stroller should have a flag, and I agree. For me the flag is a symbol of what I have experienced about the part of the country that I have passed through so far, an ideal that I, to be honest, did not expect. The country really does feel like a community of caring people. I know that there is a unique nature to my trip that attracts interest, but I think it would be unfortunate to dismiss my experiences as an anomaly. Perhaps because I am so dependent on the help of strangers, I am judging less, more open to each person as a friend. But I am not sure that this has to change when I return home. I am not sure that I am any less interdependent in my normal routine. I hope I can carry this feeling--this way of being--with me long after this summer ends. So, thank you to the wonderful people who have helped me much more that you can imagine. I feel like others, both at home and in my travels, have infused the trip with meaning and I have a job of many to do in all this, a singular one, of just running home. Somehow it is already afternoon, and I have to leave this nice hotel and start running, but I want to share my thoughts from Father's Day first. 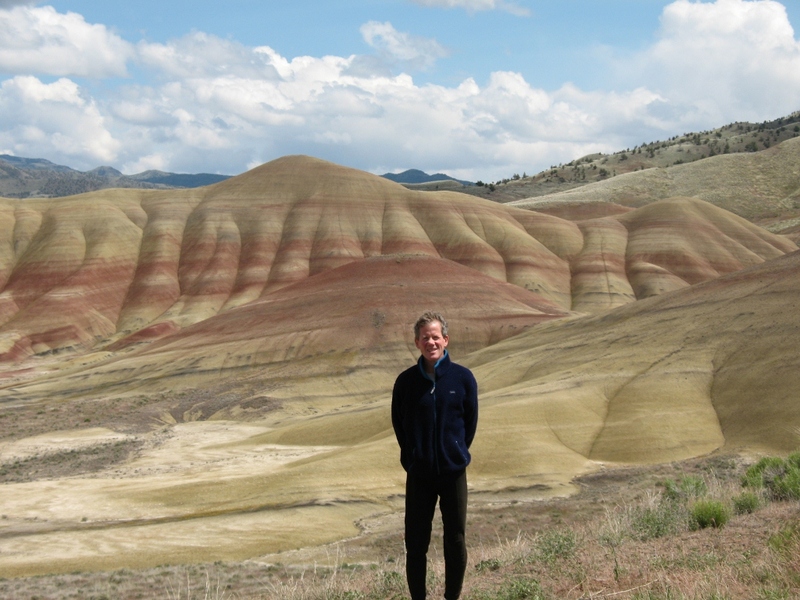 The reporter from our local paper, Richie Davis, had asked me about Father's Day at the beginning of the trip, and I told him that I hadn't thought about it; I'm not much of a holiday person. It turns out Father's Day was my toughest day weatherwise, with the rain and wind and lightning that I described earlier. I found myself thinking about and missing my dad acutely, and this continued to clarify for me why I am doing this. A mantra dominated my thoughts during that period: "it is not ok." As my dad was suffering from Alzheimer's it was really hard to process for me--so overwhelming. Now many years after he passed away, I finally have an opportunity to cry this out. It is not ok that over one hundred years after Alzheimer's was identified that there is still nothing--not one thing--that can slow or stop the disease. Beautiful people--my dad and millions of others--have suffered so much. I believe there is hope in this generation to change this. In honor of the people we love with Alzheimer's and for our children, please join with me to advocate for and support more research funding for Alzheimer's disease. 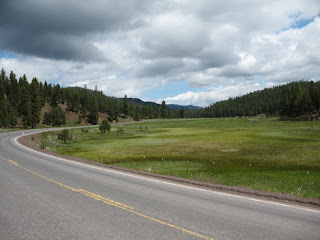 Thursday, on day seven, climbing up through Ochoco National Forest, I finally felt like I was in a groove. 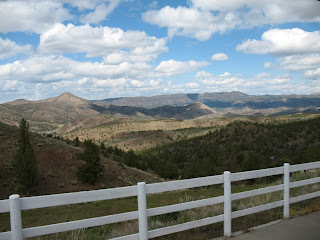 Lighter traffic allowed me to lose myself in my thoughts, appreciate the unfamiliar yet inviting ponderosa forest that surrounded me, and even sing my favorite old songs loudly for my own amusement. The day before I decided my ankle needed a break, and my sister Doreen sprung into action, calling a fellow Caldwell-Banker real estate agent in Prineville, were I sat moping, to see if there were any runners there who might host me for the night so I could heal. They suggested Norm Smith, who owned Xtreme Fitness Center with his wife Alicia. Norm has completed many Ironman competitions and happens to as nice as he is inspiring. Within minutes, Doreen called Norm and Norm called me and I had an invitation to relax at the fitness center during the day and an spend the night with Norm and Alicia. Thank you, Norm and Alicia! So I had a half day of rest, ice, and ibuprofen for my ankle, and I felt ready to test it out the next day. Norm leaves for work at 3am, so I could get an early start and have lots of time to cover the 40 miles to my next lodging. I intended to walk the whole day, and beyond if needed, until my ankle proved to be up for running again. I would stop midway to camp if my ankle pain returned; I had enough food and beverage for two days if necessary. 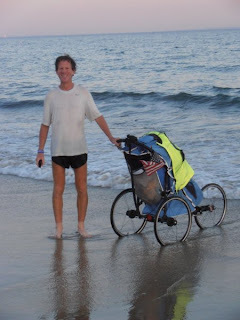 Before setting out, we weighed me--good news, no change in weight--and my stroller--yikes, 60 pounds! I am convinced that I injured my leg on the full day of descending Mt. Hood, and my heavy stroller surely compounded the problem, adding to the strain on my legs and altering my stride. 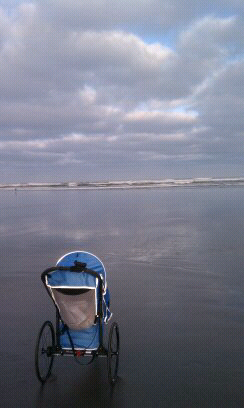 I should say that the stroller is strikingly easy to push with 40 pounds of cargo. I couldn't be more happy with it. Yet, I underappreciated--foolishly, since I know better--the strain of all this downhill running so early in my trip. Back to Thursday: the early start was glorious, and I was on top of the world with enthusiasm and optimism. I had no pain while walking, and it was encouraging to realize that I could walk 40 miles per day if I needed to heal. Unfortunately, thirty miles into my walk as I crested the pass and began a steep descent--the first of the day--my ankle developed significant pain. It was windy and sleeting at the time, so I limped down from the pass as gently as I could, and the pain subsided as the road became less steep. 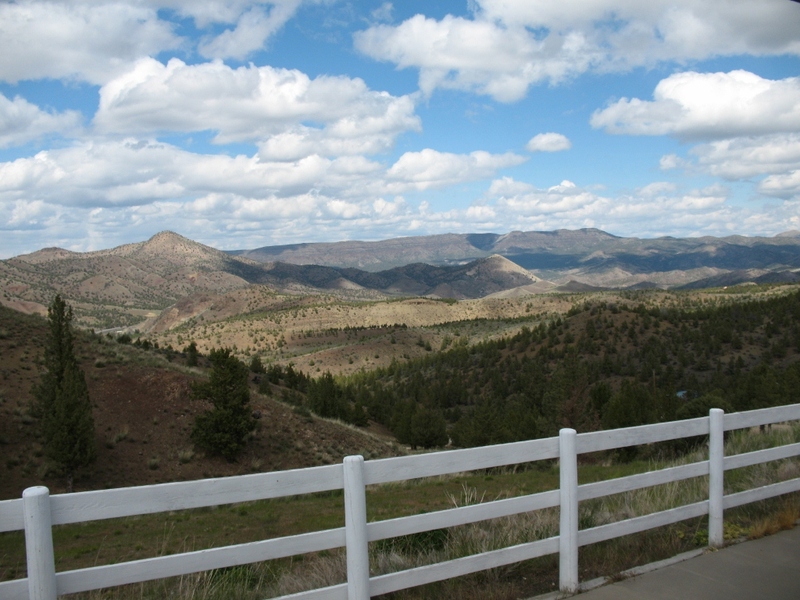 The pain returned as I climbed the mile-long steep gravel road to the bunkhouse. Upon arrival I iced immediately, but I had already done too much damage. I woke up Friday morning at 5 without improvement in the pain or swelling, so I went back to sleep and slept to 8--much needed catchup. I spent the rest of the day Friday resting, icing, and elevating my leg. I also took regular ibuprofen--6 tablets per day. Even these things did not significantly reduce the pain or inflammation. It is very hard for me not to make progress for home, but I understand, thanks to many of you, that I need to recover before traveling on. This lodging was provided to me by a son Nick of Joan and Nick's from Portland. Nick maintains this "bunkhouse" for teams of scientists doing fieldwork in the area. Living here at this time are Julie and Donovan, who are studying the movement patterns of beavers in this challenging high-desert environment. Nick has generously welcomed me to stay on here to recover, and I really don't think I have a choice to move on yet. My next lodging, also provided by Nick, is another bunkhouse 46 miles away. While that normally would be a perfect day's travel distance, I expect I will want to camp along the way so I don't overtax my ankle before it is strong. I'm very grateful to Nick for these places to stay. There is no cell coverage in the area, so it is nice that I have access to a phone so I can talk with my family. Also, the view, as you can see in this picture, is stunning. What a beautiful area! Nick has also given me much-needed route information for my next several days of travel through areas with no services. Thank you, Nick! So, it has been a time of paradoxes. On the day when I first had confidence and enthusiasm that I will make it home, I disable myself and cast new uncertainty on the trip. Secondly, though I worked hard to pack light, preparing for the many contingencies resulted in a heavy stroller, which ultimately decreased, not increased, my chances of succeeding. Both of these were predictable, and hopefully they will be two small lessons among many at the beginning of a long adventure. Thank you everyone for your support in all of the many ways! Ankle is my first test. The front of my left ankle began stiffening yesterday, so I babied it through the afternoon. By late afternoon it was clearly a problem to reckon with, so I iced it and took a short rest. I decided to walk until it loosened up, but it became increasingly stiff. A couple of ibuprofen at 6 pm seemed to help, and I walked for 3 ply more hours until darkness came and the stiffening returned. I wasn't sure what I would wake up to, but so far I am encouraged. I haven't hit the road yet (cell battery died during the night so no alarm), but it seemed to improve somewhat. I plan on being extra careful today--I always am careful--and continue on the ibuprofen. Meanwhile, the evening was lovely for a walk. The scary highway traffic that dominated the rest of the day diminished, and in the quiet I was serenated by birds and treated to watching the effortless elegance of antelope running in the grasslands to the east. With fewer cars the drivers were more friendly. I generally move onto the loose gravel shoulder when passed and make eye contact. There were many more friendly waves, beeps, and smiles. The most exciting encounter was in the afternoon when I entered Madras and was greeted at an intersection by Rob and Tracy Berg, who run the airport in town. A friend of theirs, who heard about my trip through my brother-in-law's supercub.org website, saw by my tracker that I was entering town. They dropped everything and raced over to meet me. (They needn't have hurried; I was moving slowly.) They offered me all the hospitality a road-weary traveler might want, but I was anxious to keep moving, given my slow pace. I did take away the joy that comes from feeling at home in a far away place, when lovely people reach out. Thank you. Now, off to test my ankle! I am so moved by all the support I have been getting. Thank you! I have not had time (yet!) to respond individually, but reading all the encouraging, loving comments has been sustaining me. My body seems to be holding up OK; my biggest worry is getting sufficient calories, especially over the next several days when I enter a region with few or no services. (I am bummed because I just ate a yogurt and then realized it was artificially sweetened, wasting some precious appetite.) In retrospect, it might have been easier to run westward, since I am still figuring so much out about how to manage everything on the road; it would be much easier if there were places to buy food along the way. My biggest challenges are more emotional, particularly at the beginnings of days when I am often filled with self doubt and loneliness. However, the emotional highs have been intense and life changing. I generally have an incredibly rich life, filled with family and friends that I love and who love me back. However, the amount of deep emotional connectedness I feel with so many people right now, old friends and new, and even strangers, has been powerful. Some of this might be explained by how dependent I am on others right now. But I think a bigger part is that people have such goodness, and my circumstances are such that I am seeing that goodness from so many people all day long and so intensely. This morning is 32 degrees and raining, and I will be running along the shoulder of a truck-filled highway. I have 48 miles to the next settlement, Warm Springs. I’m hoping Warm Springs is aptly named! But in spite of this gloomy start, I know I am ready to take on the day, and I know that it will be filled with joys and challenges that I am so privileged to experience. There is so much I want to say, but I will end for now with deep thanks to all of you. I hear that you are being very generous with donations to the Cure Alzheimer’s Fund, which means a lot to me. Thank you! So many of you have been sharing word of this trip through your own networks, and I am touched several times a day when folks contact me and I hear how they came to find out. Not only does it serve my goals, but it is really such a lovely demonstration of community at its very best. Finally, many people are sharing their own stories of loved ones with Alzheimer’s, some privately and some to be published on the ‘Alz Stories’ page, and I feel so honored to hear these stories and to help share them. I believe that people need to hear these stories of dignity and pain, to understand the nature of Alzheimer’s. 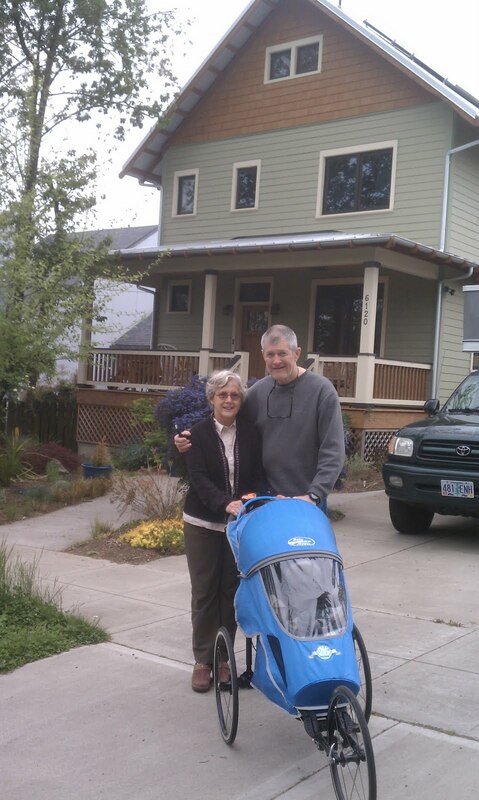 I included a photo here of my Portland friends Joan and Nick Bouwes, who over these first few days have been the epitome of love and thoughtfulness. I needed their support in these first few days, and I will carry their generosity with me always. Through Joan and Nick, I had the privilege of meeting many wonderful people, including Seth, who reminded me how joyous it is running with others (and who fixed me up with maltodextrin!). In early May I will begin posting regular updates through Blogger, Facebook, Twitter, Picasa, and YouTube. The AlzRun.org website will give you access to most of this content and more. Tweets and blog posts will also show up on the AlzRun Facebook page. If you have any general questions or comments, feel free to email me at AlzRun@gmail.com. (c) 2011 Glenn Caffery. Powered by Blogger.